We hope you will join us in exploring the hundreds of unique and extraordinary private gardens that volunteer to share their gardens with the public through Open Days. Below is a state-by-state listing of Open Days around the country*. For complete garden-visiting information, see our full, interactive Open Days Schedule in April and don't forget to sign up for our email reminders for your region. Don't forget to buy your Open Days Directory and discounted admission tickets. Or, become a member and receive a free Directory and the opportunity to purchase 50% discounted admission tickets! 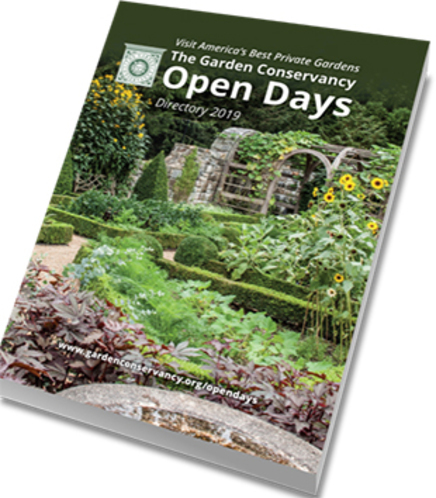 Click here to order your copy of the 2019 Open Days Directory now! *Please note: The 2019 Open Days schedule is still in formation and subject to change. Members receive a copy of the directory free! You can also order additional copies and admission tickets to Open Days here.